This release was triggered by a (as usual very reasonable) CRAN request to update the per-package manual page which had become stale. We now use Rd macros, you can see the diff for just that file at GitHub; I also include it below. My pkgKitten package-creation helper uses the same scheme, I wholeheartedly recommend it -- as the diff shows, it makes things a lot simpler. 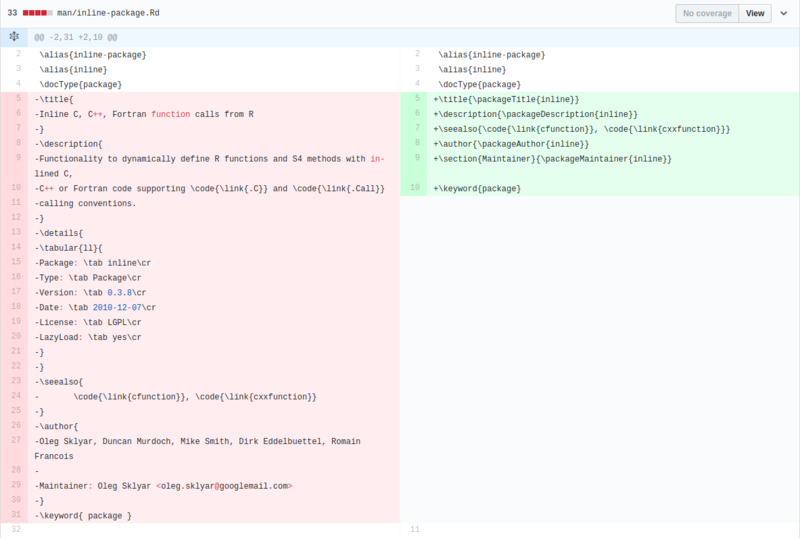 Some other changes reflect both two user-contributed pull request, as well as standard minor package update issues. See below for a detailed list of changes extracted from the NEWS file. Correct requireNamespace() call thanks (Alexander Grueneberg in #5). Small simplification to .travis.yml; also switch to https. Use seq_along instead of seq(along=...) (Watal M. Iwasaki) in #6). Courtesy of CRANberries, there is a comparison to the previous release.